Delicious kid-friendly food is prepared fresh daily in our on-site camp kitchen. Lunch is served buffet style and campers may choose from an array of hot dishes, sandwiches, yogurt, and a salad bar. Fresh fruit, fresh and cooked vegetables, bagels and whole wheat pasta are always available. Campers are offered a variety of drink choices at lunch including water, apple juice, fruit punch and lemonade. Ivy League maintains a nut aware and trans-fat free environment and accommodates campers with allergies, special dietary requirements and finicky eaters. A refreshing snack is served to each camper daily. 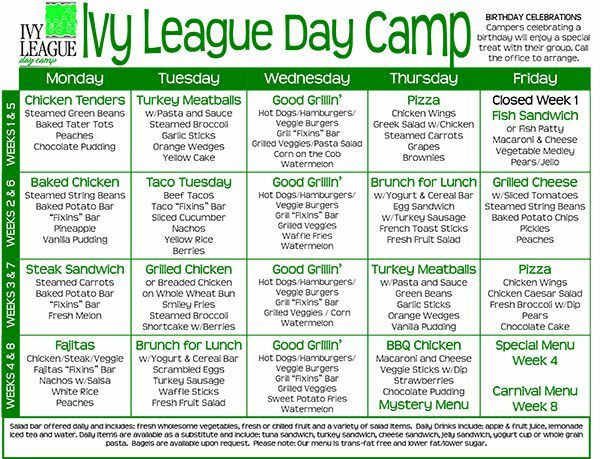 Prior to the beginning of camp, you will receive a full summer’s menu.